Let’s perform some basic mathematics, which many people just can’t get. There are 24-hours in the day, last time I checked. You probably train, if you’re using one of my programs, only 1 hour a day a few times a week, leaving many 23-24 hour stretches not working out. This means your muscles rely on what you put in your mouth during those times – or stays out – of your mouth. So why don’t we talk about muscle-building nutrition more often? Over the next two days I’ll share some unique strategies to eat for big muscle, many which can be applied to fat loss, equally effectively. 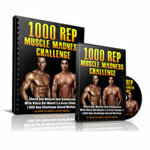 These strategies are designed to blow you up into a walking-beast that guys want to be and girls want to be with. These strategies are not intended to make you “that guy” with his legs crossed trying to hid his gut when he’s sitting down. 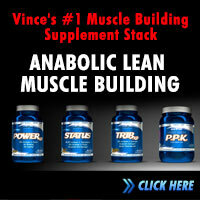 Everything is intended to maximize the muscle-to-fat ratio on your body. When you’re in doubt, stick to the foods your grandma and grandpa would have eaten. If that standard is too high, don’t eat any foods that your parents would not recognize as food. I still remember the look my Mom gave me when she found a tub of protein powder in her kitchen. “Why don’t you just make some eggs?” she said to me. How do you know if it’s real food? It should only have one ingredient in it. How many ingredients does broccoli have it in? One. That is a real food. Fill your grocery cart with foods like lean beef, nuts, and vegetables, which contain nutrients that your muscles crave. Plus they supply a steadier release of amino acids and glucose that “fake food” that is packaged and found in the middle of the aisles of your local grocery store. Do you think you need to prepare every meal with a calculator in your hand plus a food scale? I hope not. I’ve never weighed my food in my life. I don’t even know where to buy a food scale. Any diet that requires more than basic measuring of ingredients is a diet that is too complicated and will ultimately fail. I’ve found that it’s best to approach your diet with a relaxed attitude and not got bogged down by exact measurements of nutritional content. Make protein the starting point for each meal and snack – then surround it with a supporting cast of carbs and fat – it’s that simple. Show your muscles some love by treating them to some fatty fish such as arctic char, mackerel, rainbow trout, salmon and sardines 3-4 times per week. Fish is excellent post workout because their protein digests quicker than beef, poultry and pork. Since fatty fish is abundant in omega-3’s, which reduce inflammation, these hook ups can get you back in the power rack squatting heavy again. Fatty fish also contain a high amount of vitamin D, which improves muscle function and strength. Low vitamin D levels is linked to low testosterone levels, which can lead to fat gain. Sticking to the same colored food can get bland and boring. Your diet should consist of a variety of colors from fruits and vegetables to ensure a wide range of antioxidants, which help in muscle recovery and promote growth. Research studies show that a diet with a variety of fruits and vegetables prevents cell DNA damage, which can cause slower hypertrophy and initiate disease. Next time you do your groceries, include these foods: broccoli, carrots, cherries, kale, blueberries, kiwi and red bell peppers. These are the highest anti-oxidant rich foods in the produce section. Find yourself some game meats like bison, elk, ostrich and venison, which have been the top quality muscle-building foods for a long time. They have a superior protein-to-fat ratio that results in lean muscle mass and they are mostly grass-fed with plenty of room to roam. Unfortunately, now our stores are filled with industry-raised cattle that lack of the same “beef” our game meat contains. Look for farmer markets that carry grass-fed beef. If you can’t do that, visit your local farmer and become friends. That is just as good! A lot of farms are the best place to stock your fridge with muscle-building power foods such as eggs, meats, vegetables, which haven’t not been abused by pesticides and hormones. You can often get better deals buying locally, which means you don’t have to eat on the cheap. My good friend, Eric Wong, and I buy a grass-fed cow every few months and get it sliced it up for a few months worth of top quality feet, from a variety of cuts. I figure I save a few hundred bucks a year buying from a farmer instead of a grocery store. If breakfast is more important than every meal in the day, why not have it twice? Nighttime is the most catabolic time for muscle growth and your liver glycogen is depleted while you sleep. To but the brakes on, wake up at 6 am and slam back a morning shake. Here’s one of my favorites: 1 banana, 1 cup of coffee (or 1 shot of espresso), 2 scoops of Chocolate Iso-Smooth from Blue Star Nutrition (use the coupon code “maximize” if you order to get a discount), and 1 table spoon of almond butter. This will get you revved up for you day and set the stage for a healthy day of eating. About 60-minutes later, follow up with a “real” breakfast consisting of whole food like scrambled eggs, organic bacon, slow-burning carbs like oatmeal or whole-grain toast for long-lasting energy. 1. In a blender, mix all the ingredients (except for the banana). Blend until the mix gets thick. 3. Poor the mix in a muffin cooking pan, and cook at 350 degrees F. until cooked (About 30 minutes). Hey Vinny, are you eating Paleo? Vinny, on the muffin recipe, I have read that the baking process will denature the protein powder basically making it useless. How about checking with Chef Dave for his thoughts on this. 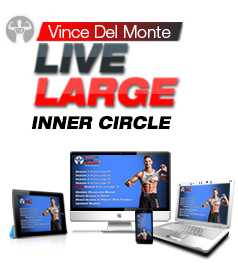 @vince_delmonte – I like all the tips you throw out man! I am currently 6’4″ 210lbs. I graduated highschool in 2004 at 305lbs! very overweight! Through alot of your tips and others like lee hayward ive been able to build a decent physique and gain some muscle! By the way im a big deer hunter and have 8 proccessed deer in the freezer! How bout a trade of venison for the new program u out out! LOL! Hey Vinnie – great advice as usual. I am sold on clean eating non processed foods. Lost over 23 pounds of fat last year without muscle loss. I’m sold. 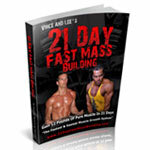 Thanks Vince, I’ve been following your program and believe in it and recommend it to everyone. Your No-Nonsence nutrition guide has proven extremely valuable to me. I do not let 30 minutes go by after waking to eat at least 30 grams of protein to kick start my metabolism. Keep up the great work. Why do you need Splenda in the muffins? Isnt that for people who have Diabetes? In my opinion this is the best blog post you’ve written! I agree wholeheardetly with EVERYTHING in it. I think this is the most important idea/principle that people who want a healthy and good looking body need to realise. Not much more to say, fantastic article Vince. Great advise as always Vince! I have a steady source of venizon and LOVE it! Good stuff bro and I especially like point #5. That’s definitely an underrated strategy that more guys need to hop on these days….bison is definitely on my list of top muscle building foods and it tastes 10 times better than chicken & tuna. PS – Tear it up at the show Dave! It's not often you see sardines recommended as a healthy (or even enjoyable) food. It's one of my favorite fill-me-up-dont-feel-bad snacks. I like 'em all but small brisling from King Oscar have to be some of the best. Protein, healthy fat (fish and olive oils) and calcium. Who knows what kind of micro nutrients. Only problem is they're relatively salty. Try sardines in mustard or hot sauce too. Or tomato. Oh, my wife makes me eat them outside as they're a bit smelly. No problem, get some fresh air at the same time when I take a short break from work. Yea I defiantly agree with sticking to real foods. There is all this crap food these days that are incredibly processed that (too much) it is just bad for you. Date a cowgirl was the most worth important tip for me. Since I am married I will find a farmer and see if I can't get some home grown meat and eggs to get me leaner. I sure the food tastes better from these farmers anyways. I really like Dianne's suggestions re:stevia instead of splenda, how to go gluten free, etc. but would like to know how you feel about using a microwave to reheat the remaining muffins. I had heard that the microwave is not a good thing. Thanks, Ann. I was curious, If i am unable to reach my caloric goal. Would a Mass gainer shake be benficial to account for those calories to make the goal??? I personally do not like eating 3000+ calories, i feel crappy. I am lukier than most, as my wonderful wife of 35 years knows about the food part and goes well out of her way to provide all of the things you mention above. THe buy local is huge for us and we frequent our local food coop in the winter and then two local Farmer’s markets in Minneapolis and St. Paul in the summer and fall for the organic meats, eggs and fresh vegetables of every color and kind!. Some of these can now be purchased inthe local grocery stores, but they are more expensive and I am still not sure I trust their “organic” label. You are so right in not trusting the "organic label" in the stores. In order to be certified organic, your soil must be pesticide and herbacide free for 3 years in a row and it has to be tested every year. Any one can slap an organic label on but to be certified organic is another story. Also, just because the growers are organic, doesn't mean that there wont be any traces of chemicals. Spray can drift for a few miles in the right circumstances, so if a farmer a couple miles away is spraying his crop and the breeze is just right, it can drift to your garden. So even though it says organic, there can still be traces of chemicals, but it is still so much better than what is in the stores. I'd still make sure and wash it good. Good points Tracy. Thanks for the added info! Even moved off skim milk to 1% moving onto whole milk again – getting to the concept of ' real food, whole foods'. Love that this has Canadian content in it too…that rocks! Question – if a guy is working out 5-6 times per week, watches his diet and still isn't making the gains he thinks ought to be happening, what would you suggest? That is my situation. Which is why I have signed up for this program. Mind you, I have only been in the gym seriously for 1 yr. In that time, I have dropped 15 lbs , increased my arms by an 1 inch…dropped two sizes on my pants…so, am I being un-realistic?? The comment about real food has been my motto for the last little while and it makes a world of difference. As far as game meats go, give them a chance if you haven't. I'm fortunate enough to drive by an organic farmers market on my way home every night, so I often stop and purchase some awesome bison or elk or even grass fed beef (all local, grass-fed and antibiotic free) if I want something more 'traditional'. Thanks for the recipe Vince! The Last Two! I sort of already do this… but I've been off bacon for a cpl yrs now. trying to cut that bad fat out. Is organic bacon ok for you?? not high in fat? Really good article today. All of these will certainly come in handy!! Jenni – O has a turkey bacon that is 95% fat free. Each slice has only a half gram of fat and only 20 calories. It tastes good. I use it in breakfast burritos with egg beaters and fat free cheese. Very good. Date A Cowgirl! I can dig that. Grass fed meats, free range chickens, and any locally grown pesticide, hormone, and antibiotic free foods are the way to go. As an added bonus you meet some cool people and support the local food movements! Yehaaw! but what is Splenda? i looked in the internett but there was no translation into german…. – Omega-3's reduce inflammation. Didn't know about that one. I am very fortunate. For one, I am a real Cowgirl, I have cowboyed on cattle ranches for 20 years. I'm not doing that anymore but I grow a huge garden every year and sell my fresh produce to the local people. I live 12 miles out of town so I go once a week into town to sell, the people that can't drive much or work or what ever still has a chance to buy fresh locally grown. Also, I am a BIG fan and lover of Elk, and deer. I am a hunter and have been for many many years. I shoot my own game animals, clean them out and process them MYSELF. I do not trust any meat locker. Tried it once, not good at all. Time consuming yes, but at least I know what's in it and how clean it is. I also can some of the deer meat. My Husband is a truck driver and he can take some canned deer meat with him. I have to be one of the luckiest ladies around with my life and life style, and I thank God and my Husband for it every day. Thanks for your articles, they are great. 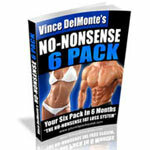 Hi Vince, wow, I didn’t know you eat 2 breakfasts! Well, white rice is what my grandma eats. But according to many people, it isn’t healthy. So I eat brown rice. 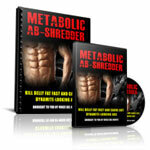 Anyway, I wanted to ask you what you think about John berardi’s g-flux principles for fat loss and body recomp? I’d appreciate it if you could share your thoughts on that! I pretty much apply all the points just about daily. Don't eat fish daily but try for twice weekly. As for the veggies…….I consume a ton…..breakfast, lunch, dinner and most snacks too. As for breakfast…..most days have 2….but in the reverse….eat the whole foods first….about 1 1/2 hrs later, workout then follow with a shake and a whole food like my protein waffles or protein muffins (i have several recipes for all kinds) FYI if you want to adapt a muffin recipe to make it more healthy, you can sub 1/4 of the flour (and replace white flour with oat flour, whole wheat, spelt) with protein powder and also replace another 1/4 with almond flour/meal. In the recipe you gave you could eliminate the wheat flour and either add more protein powder or use almond flour if you want to go gluten free. Also I am not a fan of splenda, so i always use stevia. I love 2 breakfasts!! I am not one to eat a lot right when I wake up–it just doesn't feel right and noting seems appetizong. So I get down what i can. but after my 1st workout in the morning I am ravenous! and ready for that big meal that will fuel my body for the day! Thanks for the great post. That's how you make this strategy work for you. Good job. Hey vince, loved the 2 breakfast strategy, awsome idea which i'll start doing tomorow but one question, i read that you shouldn't mix caffeine and carbs so your shake idea got me a little confused… I'm sure you know better then me but a brief explanation would help. Gooey foods make gooey bodies! Duh lol. I used to love catching my Grandparents off guard and joining them for supper when they didn't know I was comming. Basic, simple farm food. What used to be in Grandma's canning cupboard? Well let's see there was tomatoes, green beans, peaches, corn, cold pack beef. Then remember what the coach always said when I was out for football in high school "lots of water, no rice, potatoes, bread, or pasta." And we worked out hard everyday for about two hours. I came from a small rural school and we didn't have a big sports program so in the winter when there was no football the football team pretty much became the wresteling team. And what are some classic cliches regarding guys with good builds? "Those farm boys…The guys on the football team…Most of the garbage we eat regularly used to be considered treats and were only around on special occasions. Candies, cookies, cakes, etc. Don't make it complicated, just get back to basics. Hi Vince and dave , I agree with your all text, but just a question: I wonder if your program food is allowed with diabetes diet? Thans for your active helping, what an energy! Vince, the one about real food ,#1,is the best. In developing countries the guys are usually buff lean add muscular and they dont work out or eat loads of protein. Their food is organic and real yet they sometimes look like they spend hours in the gym. In your banana muffin recipe you have splenda as an ingredient. I read somewhwere that it is very unhealthy as is aspartame. Use Stevia then. Anything in moderation will not harm you. l would say for me the 1st one. l always buy tinned veg because a) l am lazy and b) it has a long shelf life. l will start buying fresh. Does anyone know about the product maximuscle promax? Is it any good? l'm a woman so don't want to end up like the hulk. l just want strength and definition. Any feedback would be appreciated! As always, you nail it. Very informative, and "No Mysterious talk", and i agree. It's a tie!!!!!!!!!!!!!!!!!!!!!! Between #1 and #6 Keep it real and what better place to get real than a local farmer that you can ask about what he uses on his produce and fruit??? Good ideas all aound Vince! pretty awesome tips. the first tip caught my attention; only one ingredient. that's more than really helpful, thanks Vince! A question though, for no 2, i'm sure calories have to be included as well, right? I agree with eating whole foods, most of my diet consists of whole foods,(with the exception of ice cream on my cheat days!). It is amazing how difficult it is to find non processed and high protien foods in the supermarket, however the extra energy it gives you is well worth the effort! In regard to lean game meat we have a virtually no fat, extremely high protien meat that is grown in its natural environment here in Australia, its called kangaroo. If you ever venture down under check it out! I'm coming in 2011 with Flavia. I'll try it then! Thanks Vinny. Good stuff. Although I must say I am confused. I am not trying to be difficult, just trying to sort suff out. 1. I probably had that in my yspq book in terms of fat loss. Everything in moderation. 2. I don't bash supplements. I state they only make a 5-10% difference and that most do not work. Great post. Love #6. What a great plan to buy from local farmers. Never thought that it could actually save me some money as well as eating healthier and cleaner, while supporting the local farmers. It’s a win-win. Thanks Vinny, keep up the good work. Dave Ruels anabolic cooking book is brilliant – I have been creating nutritious recipes for the last year and by far the best book I have come across. Even woke up this morning and made his strawberry high protein ice cream as a treat for after dinner tonight and surprising the wife who thinks ice cream is only for her cheat day! I like the dual breakfast and the fish info. I have always like dual breakfasts – it is just that it used to be half a dozen cups of coffee right of the bat and a high-fiber cereal (with more coffee) about 40 minutes after I woke). I have been taking Omega 3 and Vitamin D3 supplements for a couple years because I found out the absolute need for them and knew I wasn't getting anywhere near enough with my diet. I wasn't aware that fish protein digested faster than the other meats. I think I need a list of speed of digestion. I thought that all meals got into the system in about 1 hour and then we dealt with how long it takes for the proteins to get to the system. How does fish rate with whey protein in time of delivery? Dave Ruel is a really cool dude, be sure to support him. Thanks man. Dave's recipe guide is fantastic. really awesome advice here. I really like tip #2. I have never fully calculated any of my meals, but I like to do a ruff estimate of everything I eat and I ALWAYS circulate my meals and snacks around protein then carbs, but when it comes to fats I am not exactly sure what to do. For example, I am making a sandwich or two containing whole wheat bread, turkey/ham, lettuce, peppers, and cheese. Is there any significant fat that I need in there? I would really appreciate your help! Add some olive oil on the bread. Great tip, that #3! Was eating fatty fish only once a week. Tip #7 is excellent as well for me, cause at 6am I’m still in the lazy mode. Just search my recent blog posts… loads of posts on this. I've always been a fan of 'second breakfast', good to see that on the list. Then again, my past idea of 'second breakfast' was eating two meals a day of junk like sugared-up cereal, muffins, and bagels full of HFCS. Nowadays I'm on the eggs, bacon, almonds, and tea express (with some steak or pork chops thrown in now and again to keep it interesting). I'll have to try that protein shake recipe. If I leave out the coffee, d'you s'pose it's a good right-before-bed thing, too, to give the body something other than itself to nosh on during the night? I've had people tell me to down protein before bed to cut back on catabolic rate, and then others tell me that protein right before bed will disrupt your sleep pattern and that that's even worse than any metabolic tweaks. You are 100% right bro, real food (I love the grass fed stuff) beats MRP's n shakes any day of the week. I'll also have to try that recipe out, it looks killer. I wonder if it will still taste legit if I substitute the splenda for stevia tho. I'm sure it will taste just as good. The two breakfasts appealed to me as getting really set up for the day, and also seeking out meat like ostrich and venison. Belgian Blue beef is also a low fat red meat, worth a try IMO. I agree hihgh quality whole foods are the way to go for building muscle mass and supporting overall health. Nothing beats them…not even protein powders and MRP's. Hi Ricardo you're right about the estrogenic chemicals in most foods today. They're even in most health and beauty products. Not to mention that unfermented soy that's in almost everything. Some are still singing the praises of that stuff. I know from research that I can get whatever benefits soy offers elsewhere without adding additional bad estrogen (estradiol) to my body. In my opinion you're better off manufacturing and growing your own vegetables, fruit, meat and health, cleaning and beauty products. Good job on this blog Vinny! I loved that you made it simple but very clear. I like that you even gave us a bit of a grocery list and even a recipe. Its awesome! Keep at it! Love ya bud! No problem bro. thanks for reading. pretty soon we'll get you and steve's before and afters up on this site too. Ditto. Agree 100%. I liked tip #7 the most and even bought some of the ISO-Smooth protein. I've got to get some before and after pics up, too, cause I think I'm finally making headway. Yea tip #7 is in insane. I always eat "2 breakfast's."